Set in a beautifully refurbished 19th-century old building that used to belong to a high-ranking political family, boutique-style In[n]Athens offers a comfortable, home-like stay well away from anywhere hotel-like, yet provides all the style, comfort, and amenities you’d desire from a top-range hotel. Its central location (very close to Syntagma square) makes it an ideal base for visiting the sites by foot. The 22 rooms are separated into four categories here (sized from 15m sq to 35m sq). Starting with sleep-time, you’ll be glad to find all rooms are decked out with super-comfy Coco-mat pillows, bed linen, and mattresses that are made with layer upon layer of eco-friendly materials. The sleek, minimalist decor is themed with earthy colors and industrial accents, utilizing textures like wood, stone, steel and glass and chiefly custom-made furnishings and decor items. Most rooms have lovely natural lighting and all have a flat-screen TV and safe, as well as free Wi-Fi access (as offered throughout the hotel). The suite and family rooms come with a Nespresso coffee machine. YOU SHOULD KNOW The rooms by the side-street, near the entrance, don’t have any view to speak of. Sometimes the courtyard can get noisy at night, so avoid rooms at the rear or on the ground or first floors if you want 100 percent silence. The bathrooms are on the small side, but stylish.There’s an intentional contrast between the post-industrial gray of the walls and the rough exposed marble sinks that echo classical Greece, suggesting the hotel is somewhere between the old and new. Toiletries are by Greek designer cosmetics company Olive. YOU SHOULD KNOW There isn't any natural ventilation and the room is a bit dark, both due to a lack of natural lighting and windows and due to the use of black glass features, like in shower doors and partitions, as a design feature. A modern area with an unexpected combo of an industrial chic and an archaic theme touches of greenery and art and very helpful, discreet reception staff. The reception staff can arrange everything from tours to a helicopter flight if asked in advance. 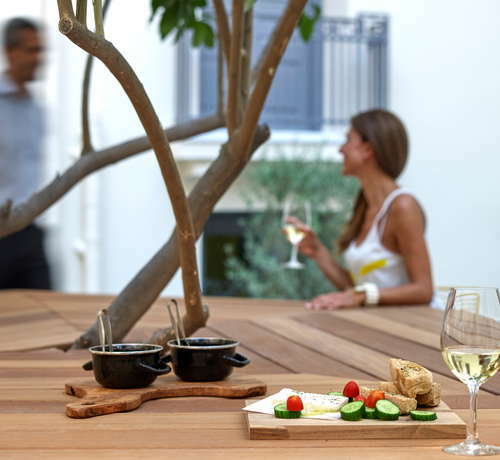 The In[n]Athens’ hub is its tranquil and pretty atrium, a leafy, village-like courtyard with an olive tree rising from a wooden table. On good days it's drenched in sunlight (but with the essential shady spots) and makes for a pleasant breakfast, reading, socializing or wine-drinking spot throughout the day. Breakfast is half buffet, half a la carte, with an ample spread of Greek cheeses & cold cuts, homemade savory pies, cakes and jams, and a choice of several types of omelets, eggs, and open sandwiches. YOU SHOULD KNOW No other meals are served here except breakfast, only snacks. After 10 a.m. and until midnight they provide a choice of wines and Greek microbrewery beers, accompanied by a snack menu made up of food platters. Coffee, tea, and refreshments are also served throughout the day. 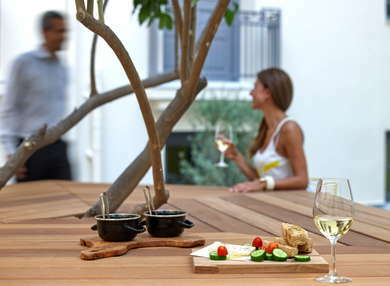 The location is exceptional for anyone eager to explore central Athens. Just a few minutes' walk from Syntagma square (from there you can take the blue line to the airport, it takes around 40 minutes to get there), you are at close proximity to some of the capital’s best shopping areas (Ermou str., Kolonaki, Monastiraki, Plaka), museums (Benaki, Cycladic Art, Acropolis museum), restaurants, bars and of course, the sites. The hotel is located near to some of Athens’ funkiest ethnic food hangouts--from Los Loros for Colombian and Venezuelan street food, East Pearl for great Chinese food and Avocado vegan-vegetarian restaurant for healthy and flavorsome dishes (5-minute walk for all). Nearby you’ll also find some excellent wine bars, serving some of the best Greek wines you can find. By The Glass (next door to the hotel) serves wine, as its name suggests, using the Coravin system, which means you can sample a glass of even the most luxuriant wines, while Oinoscent (5-minute walk) serves up over 700 labels. Another cute and dinky hangout is The Trap (5-minute walk), where you can enjoy your drink in a cozy, artsy arcade as well as some good fingerfood. More like staying at a charming and perfectly-located villa than a hotel that may lack any sense of intimacy, the elegant yet down to earth In[n]Athens sees to it that you are offered all the comforts you may desire--soft bedding, an abundant breakfast and snacks, hi-tech in-room essentials and friendly, very helpful service, and has one of the loveliest courtyards in town. $ &middot; 4 Fokianou str.